My daughter and I finally fulfilled a bit of my Disney bucket list by getting personal parasols decorated at the Magic Kingdom. The stall is in the Liberty Square area and we got some lovely pictures with out parasols by the Liberty Bell. 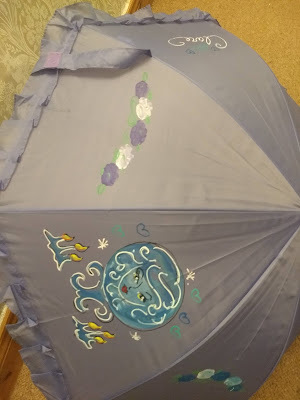 There are two sizes of parasol- mini and large. 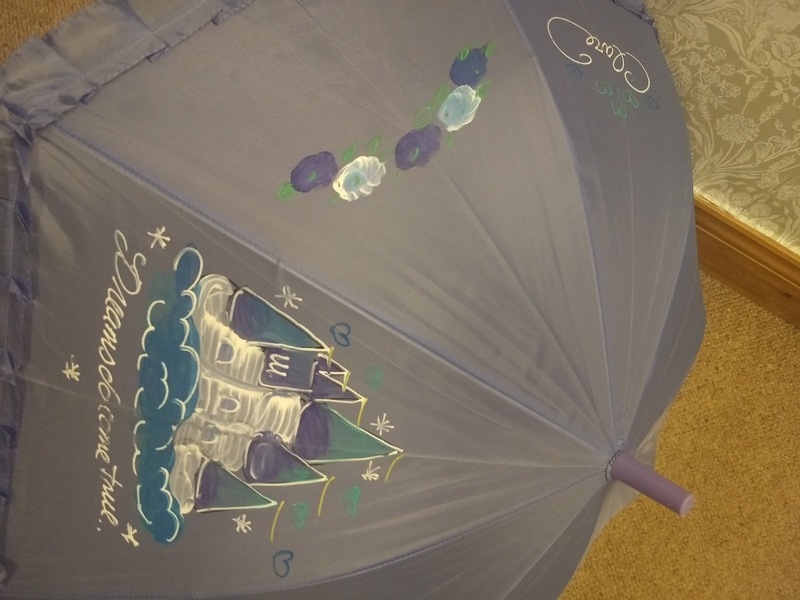 We went for large (a standard size) so these cost $16.95 for our name and flowers around the umbrella and then we both chose two designs each for our parasols at $5 each. I went for the castle and for a Haunted Mansion design. We were only going to have one picture each but we couldn’t decide! 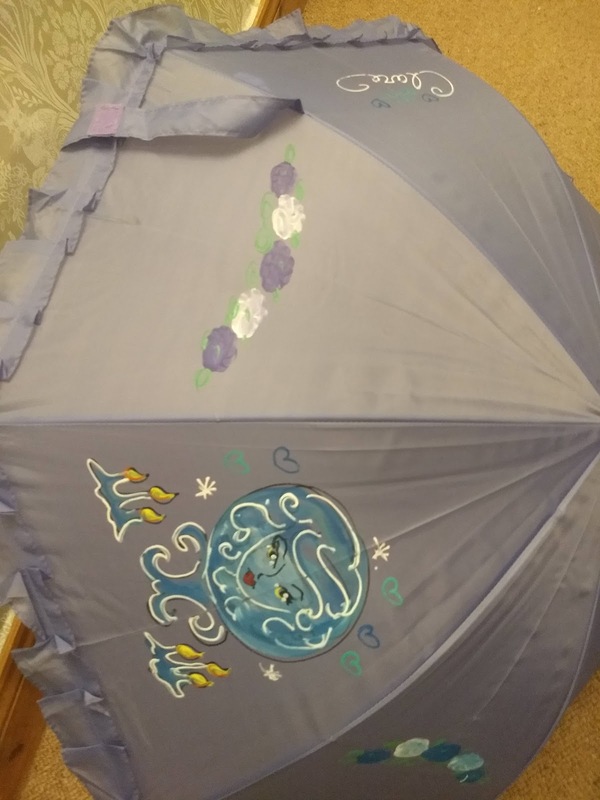 The designs are painted at the stall and we returned two hours later to pick up our parasols. These turned out to not just be pretty but also pretty practical on our hot days in the park. 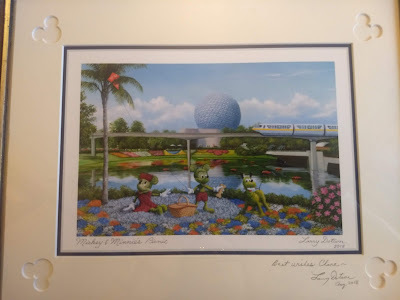 I knew before the trip that this was something I wanted to hold a photo from our holiday on our mantel piece and so when I saw them in the Arribas shop in the German Pavilion in Epcot I ordered one. There were two sizes, this is the smaller size ($45) and I was able to specify the text, font and design I wanted. I returned after 10 minutes to collect the complete frame- I love the natural wood engraving which makes this frame so special. Arribas Brothers also have silhouette artists in a number of their locations including in Magic Kingdom and Disney Springs. One evening I had the kids silhouettes done and framed. It was amazing watching the artist at work as she was so fast with her scissors, she cut the silhouettes in a couple of minutes. You get two copies of each silhouette and so we had one framed there and I framed the second set for my daughter's bedroom when we got home. 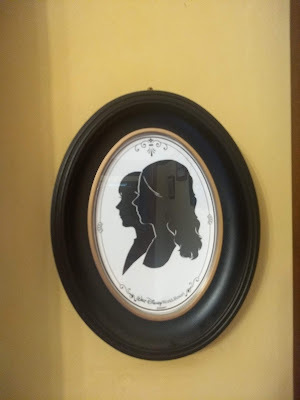 Two people silhouettes cost $20 and the frame cost $11.95. Whilst we were in the Norway Pavilion in Epcot there was a signing event by the very talented artist, Larry Dotson. Dotson has painted many scenes in Disneyland California and Walt Disney World. 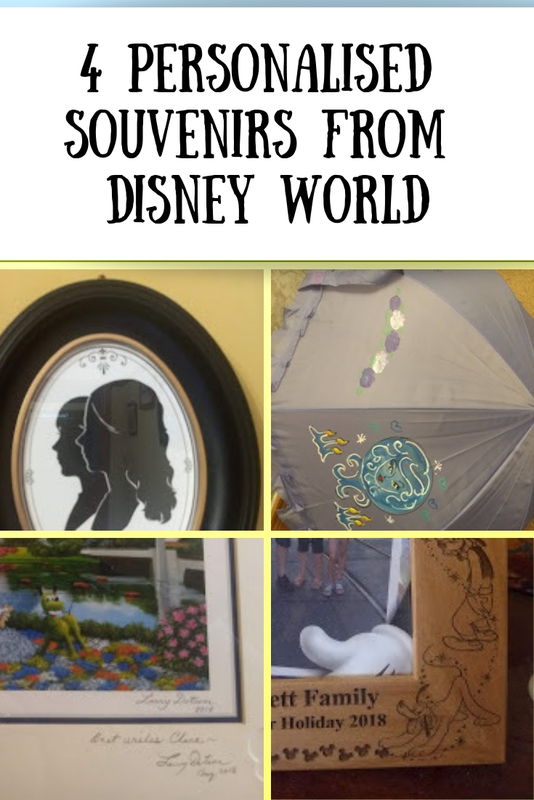 It was difficult to choose which print I loved the best to take home but eventually I went for Mickey, Minnie and Pluto made of flowers and having a picnic in Epcot. 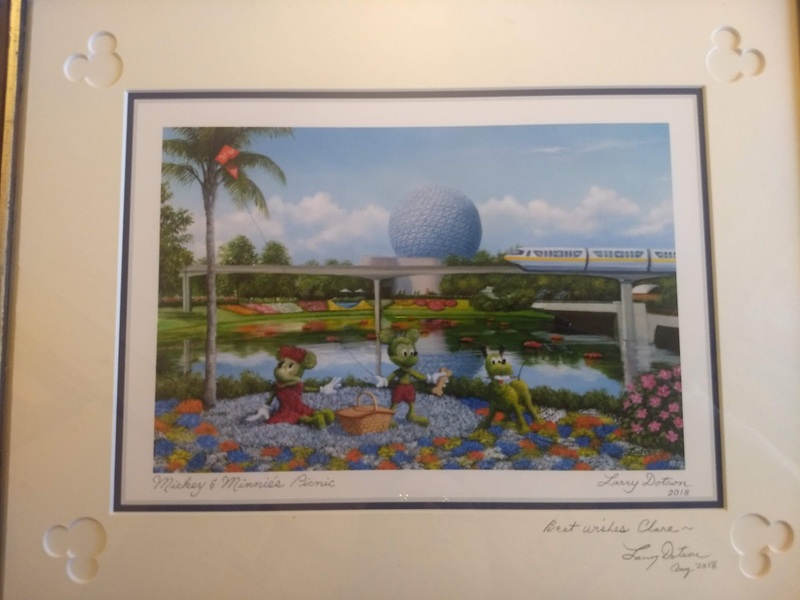 Larry kindly signed the print and I had it delivered back to our hotel shop to pick up later. At our hotel I also bought his print of Port Orleans French Quarter. Both prints, mounted but unframed, cost $35 each. 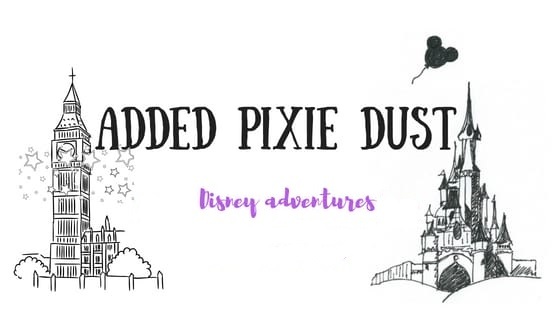 Dotson has a Facebook page so it is worth following him to see when he is doing signing events in the parks. 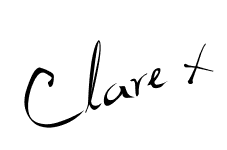 I hope this gives an insight into some of the personalised souvenirs available- if you have bought others please mention them in the comments below. These are definitely our most precious things we brought back from our holiday other than the memories. It is really the great souvenirs. I would love to explore the destination. 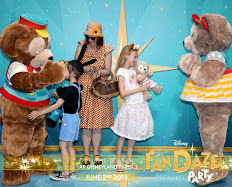 I really like to visit Disneyland in Paris to explore the amazing trips. These crafty things are really pretty. 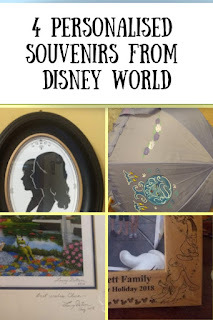 I would love have these souvenirs. 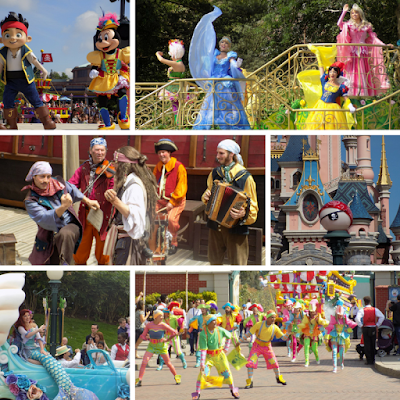 Through the disneyland paris trip planning you can plan your trip to Disneyland explore the amazing destination.